As a human being, your brain limits your ability to hold more than one conversation at a time. Your phone’s brain, however, lacks such a limitation. It’s entirely possible for an Android phone to handle more than one call at a time. It’s easy to place a call on hold using your Android phone — as long as your cellular provider hasn’t disabled that feature. Simply touch the Hold icon. To “unhold” the call, touch the Hold icon again. The icon may change its look, for example, from a pause symbol to a play symbol. Fret not if your phone lacks the Hold icon. Rather than hold the call, mute it: Touch the Mute icon on the call-in-progress screen. That way, you can sneeze, scream at the wall, or flush the toilet and the other person will never know. You’re on the phone, chatting it up. Suddenly, someone else calls you. What happens next? Your phone alerts you to the new call, perhaps by vibrating or making a sound. Look at the touchscreen to see what’s up with the incoming call, similar to what’s shown here. Answer the call. Touch the green Answer icon to answer the incoming call. The call you’re on is placed on hold. Send the call directly to voicemail. Touch the Ignore icon. The incoming call is sent directly to voicemail. Do nothing. The call eventually goes into voicemail. When you choose to answer the call and the call you’re on is placed on hold, you return to the first call when you end the second call. Or you can manage the multiple calls. After you answer a second call, your phone is working with two calls at once. In this situation, you can speak with only one person at a time; juggling two calls isn’t the same thing as participating in a conference call. 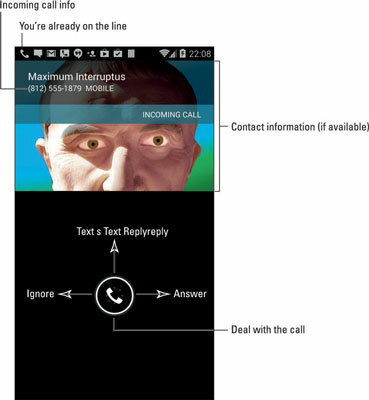 Some Android phones feature a multicall screen, similar to what’s shown in the following screen. The screen lists the calls you’re working on and lets you easily switch between them in a visual manner. Swap/Switch Calls: To switch between callers, touch the Swap or Switch Calls icon on the touchscreen. Every time you touch that icon, the conversation switches to the other caller and the current person is put on hold. 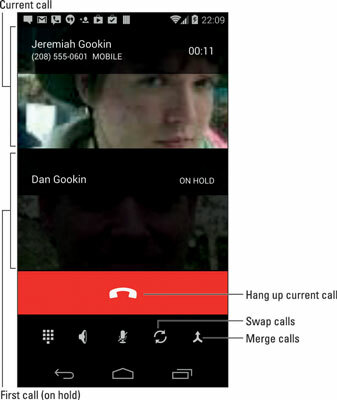 Merge Calls: To combine all calls so that everyone is talking (three people total), touch the Merge Calls icon. This icon may not be available should the merge feature be suppressed by your cellular provider. End Call: To end a call, touch the End Call icon, just as you normally do. After one call ends, the conversation returns to the other caller. You can then proceed to talk — discuss the weather, the local sports team, whatever — until you hang up or another call interrupts you. The number of different calls your phone can handle depends on your carrier. For most subscribers in the United States, your phone can handle only two calls at a time. In that case, a third person who calls you either hears a busy signal or is sent directly into voicemail. If the person on hold hangs up, you may hear a sound or feel the phone vibrate when the call is dropped. When you touch the End Call icon using an Android phone on the Verizon network, both calls may appear to have been disconnected. That’s not the case: In a few moments, the call you didn’t disconnect “rings” as though the person is calling you back. No one is calling you back, though: The phone is simply returning you to that ongoing conversation.